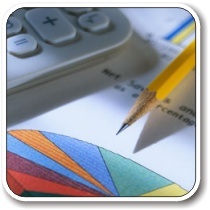 With a resident database, ShareMagic™ CHART makes it possible to work with much more data. 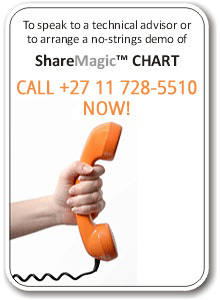 If you want longer period charts, multiple overlays and unlimited concurrent windows, ShareMagic™ CHART is the answer. Customise your work experience in ways that are not possible online. Create as many chart templates as you need, restore your previous workspace, create more powerful watchlists, and much more. A resident database enables scans and filters that are simply not feasible in a web environment. ShareMagic™ CHART lets you instantly find all shares in a strong upward trend, or to filter and sort shares at the click of a button. A resident database covering a broad range of stocks, warrants, JSE indices, international benchmarks, forex rates, commodities, and much more. At least 10 years' history (where available) for all price streams. The advantage of speed – multiple price streams can be loaded quickly from your hard drive rather than relying on internet connectivity. The ability to scan the database for technical signals (eg, find all shares giving a buy signal in the past week). Much more application control, including the capacity to save multiple templates.